The European Southern Observatory through its La Silla facilities in Chile released a new view of Comet ISON (C/2012 S1) which suddenly has become more active on 01 November. First spotted on September 2012, the comet will be at its closest to the Sun by 28 November. The comet has been getting brighter as its gets closer to the Sun. Scientists explained that the heat from the Sun is interacting with the ice in the comet making the ISON get brighter and brighter. The first outburst happened on 01 November which doubled the amount of gas emitted by the comet. The second outburst happened on 13 November making it ten times brighter. The TRAPPIST (TRAnsiting Planets and PlanetesImals Small Telescope) device was used to capture the image of the comet. 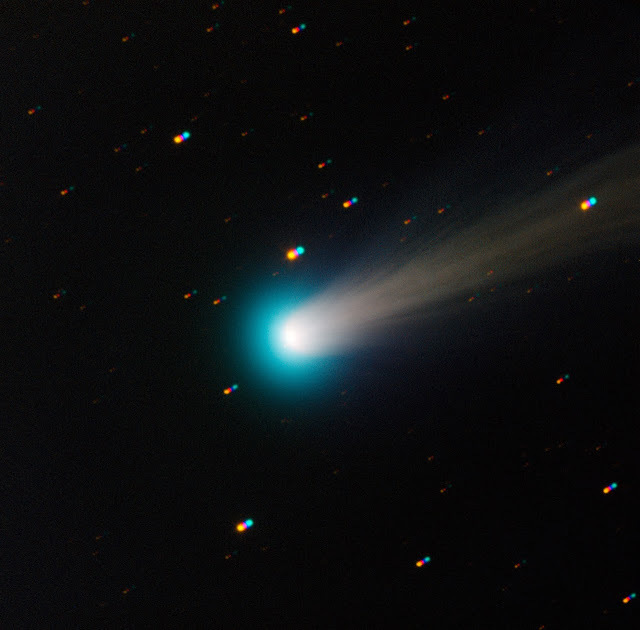 The image which is composed of four different 30-second exposures through blue, green, red, and near-infrared filters is the clearest made of the comet since its discovery. If the comet is still intact after its close approach to the sun, it will be visible to the human eye in the morning sky. These outbursts were caused by the intense heat of the Sun reaching ice in the tiny nucleus of the comet as it zooms toward the Sun, causing the ice to sublimate and throwing large amounts of dust and gas into space. By the time ISON makes its closest approach to the Sun on 28 November (at only 1.2 million kilometres from its surface — just a little less than the diameter of the Sun! ), the heat will cause even more ice to sublimate. However, it could also break the whole nucleus down into small fragments, which would completely evaporate by the time the comet moves away from the Sun's intense heat. If ISON survives its passage near the Sun, it could then become spectacularly bright in the morning sky.